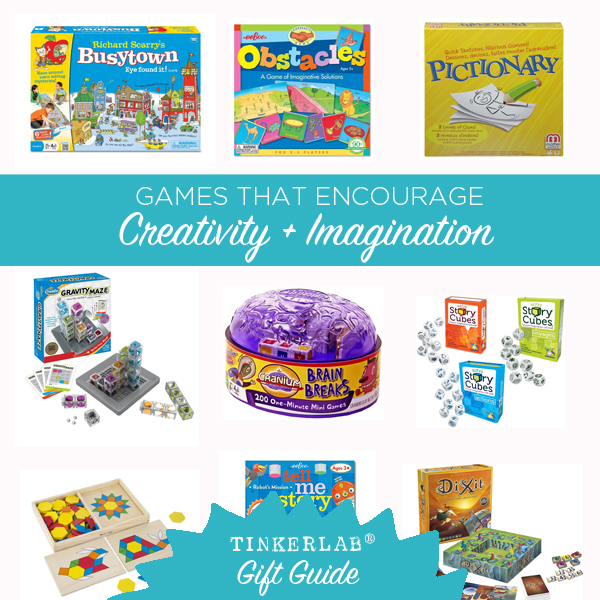 I’m often asked where we get our tinkering, science, and art supplies such as paint, tables, and tools, so I created this resource page where you can find everything you need to get started with your own maker space…or TinkerLab®. I’ll add to the list as I review new products and inspiring articles, so please bookmark this page for future reference! For your convenience, I added prices to some items. I also share featured supplies that are great deals, which you can find here. Tinkering Table and Chairs. I’m often asked about the table that my kids have (featured on the blog and in my book). It’s the Carolina Table from Pottery Barn Kids, and it’s been our durable tinkering backdrop since 2010. $199. We also have the Carolina chairs in grass green, which have been sturdy enough (and quite comfortable, actually) for adults. $69.00. Storage Cube System. The big storage system that we keep our art supplies and baskets in is also from IKEA. It’s a discontinued model (Expedit) that’s been replaced with Kallax (almost identical). Pencil Sharpener. The Xacto School-Pro Heavy Duty Pencil Sharpener is a work horse of a sharpener that’s designed by teachers. I like to sharpen all of our 100’s of colored pencils in one fell swoop, and this sharpener does the trick. $31.05. Paper Cutter. The Swingline Paper Trimmer (12″) is a high quality trimmer that’s up to cutting card stock and construction paper. You can cut up to 10 copy-weight papers at once. $26.44. Glass Storage Jars. These jars are great for storing pom poms, craft sticks, and other bulk supplies. From the Container Store. Translucent Pieces for the Light Table. Once you have a light table, you’ll want translucent pieces to place on it for exploration, composition, and design work. This 147 piece set of pattern blocks is economical at $19.99. This set of 49 pieces is only $4.00. We love this set of 250 counting chips for just $4.79. And I adore this set of 12 beautiful agate light table slices (14.99). Light-up Tracing Pad. Crayola makes a really cool tracing pad that’s great for taking to restaurants or long trips. Place your blank paper on top of a paper you want to trace, and you’re well on your way to making your own drawings. These come in blue and pink. $24.99. One step up for the Crayola pad, yet still affordable, is Artograph’s Light Tracer that enables young artists to turn their ideas into reality. Create a Sticker Machine. This machine from Xyron is something that my kids use often. They design their own stickers as drawings and then crank them through this trusty machine that adds an even layer of sticker glue to the back. $14.99. Be sure to grab a refill cartridge or two for when you run out of sticker paper. Kinetic Sand. This addictive sand that’s wonderful for sensory play (for kids as well as adults) can be pricy, but you can find a 2 pound bag of kinetic sand for $14.00. Liquid Watercolors. I really like Sax Liquid Watercolors, 8 oz. bottles. $3.99/bottle. These are a favorite for making playdough and straw painting. Watercolor Set. The gorgeous Gansai Tambi set from Kuretake is my favorite. It’s not cheap but worth it for semi-serious art journaling. They also make a mini set with fewer colors that’s more affordable. Watercolor Set, option 2. More affordable and also a favorite is the Pelikan Opaque watercolor set with 24 colors. My kids LOVE this set and are always able to find the just-right color. Tempera Cakes. These have a similar effect to watercolors, but they come in nice, large cakes and are perfect for toddlers and preschoolers. I like the Sax non-toxic set in these vibrant colors. Travel Paint Set. The 24 color field set from Sakura is my favorite take-along set for painting on the beach. We also took it with us all the way to Italy! It comes with a cool paintbrush that you can fill with water. You have to see it! Travel Paint Set, option 2. The itty bitty 12 color Pocket Box paint set from Windsor and Newton is smaller that the Sakura set and the colors are equally gorgeous. It comes with fewer colors, but it can truly fit in even the smallest bag. And the paintbrush that comes with it is amazing and one of my favorites. Detail Paintbrushes. Thin brushes for watercolor or acrylic paint. 15pcs Nail Art Painting Pen Brush. They aren’t the highest quality, but they are REALLY good, and for $2.55 it’s an amazing deal. Sketchbook. I have two favorites in this category for working with both wet and dry media. Both of these books can handle paint. Strathmore Visual Journal is made of heavy duty paper (90 pound weight), perfect for mixed media, and comes in a few sizes. For easy, on-th-go journaling, I like the 5.5″ x 8″ journal at $6.89. I also like the Canson Mix Media journal that’s 7″ x 10″ for $7.40. Colored Pencils. Prismacolor Colored Pencils. Set of 72 for $79.30 (I’ve seen them on sale for as low as $46!). Prismacolor Colored Pencils, Set of 24 for $25.19 (I’ve seen these for as low as $13.63). Beginner Microscope. My First Lab Duo-Scope Microscope.We’ve had this for a few years and it’s still holding strong. Features 40x, 100x &400x magnifications, real Glass Optics, battery operated, comes with a small set of starter slides. $63.99. 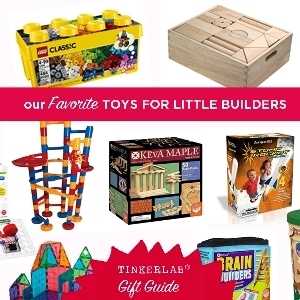 Click here or the image below for the complete list of our favorite toys for little builders. Makey Makey. Makey Makey is an easy-to-use invention kit that’s essentially a printed circuit board that connects to a computer via a USB cable. Wires connect Makey Makey to conductive objects (i.e. play dough, bananas, aluminum foil, coins), which can then be played much like a joystick or keyboard key.You can read our review here. $49.95. Enchanted Forest by Ravensburger. A great family game that encourages the use of strategy and builds active minds. It’s amagical treasure hunt in the land of fairy tales. Roll the die to determine the distance you move, making your ways to the trees to see what treasures are hidden under them. Once you’ve found the treasure the king has requested, make your way to the castle so that you can announce where it is. $23.62. Big box of Lego Bricks. You can’t go wrong with Lego! We have enjoyed the Lego kits, but the plain bricks do wonders for encouraging imagination to bloom. Build animals, buildings, vehicles and much more! This set includes 221 pieces, a sturdy storage bucket, and easy-to-follow building instructions and inspirational ideas. $13.99. Quadrilla wooden marble run. Quadrilla is the Ultimate Marble Run Building Set with endless possibilities for 3-dimensional thinking, creating captivating structures. It’s non-toxic, and child safe. Recommended for ages four years and up. $88.99. Don’t Move the Muffin Tin: A Hands-off Guide to Art for the Young Child, Bev Bos. 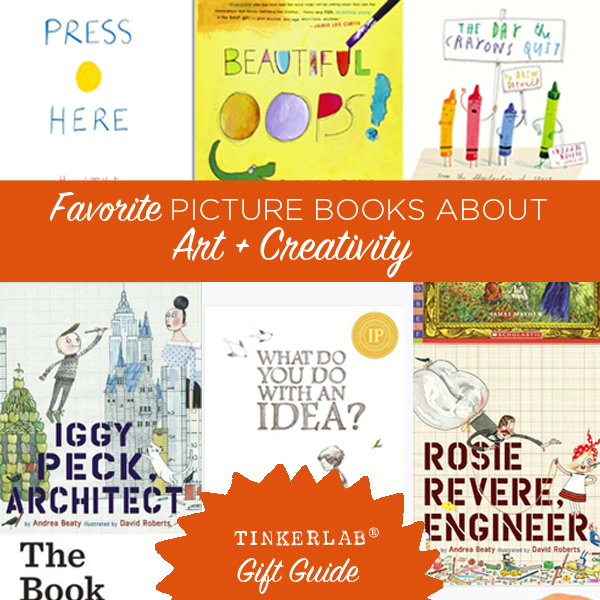 Click here or the image below for the complete list of our favorite picture books about art and creativity. Wreck This Journal, Keri Smith. The Art of Tinkering, Karen Wilkinson and Mike Petrich. Amazon. I order a lot of our supplies through Amazon because, frankly, I like the convenience and take advantage of Amazon Prime. Reuse/recycling Center. In the Bay Area we have two wonderful resources called RAFT and SCRAP where I pick up industry recycled materials at a big discount. RAFT is just for educators and requires a membership. If you like to dig for treasures and make junk sculptures with the kids, I highly recommend finding something like RAFT or SCRAP near you. Here’s a useful list of all the reuse shops worldwide! IKEA. A good spot for getting deals on storage supplies and useful kids furniture and art materials. Recycling. I “shop” for materials in our recycling bin where we salvage styrofoam, boxes, and tubes for our projects. If you have the space, set a box aside to save the best pieces for your projects. Science supplies. Nasco is a good online spot to find just about any STEM or science supply you can dream of. Big stores such as Target/Walmart/Drug Store/Dollar Store. 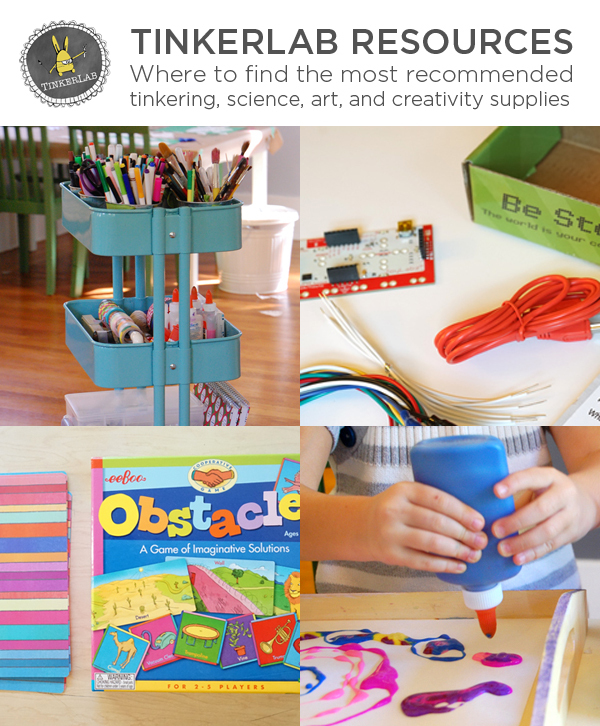 Great places to find your everyday school-ready art supplies like glue bottles, paper, pencils, crayons, etc. Target and Walmart usually put all of these on huge discount in August before the school year begins and it’s worth stocking up!